Ok, here we go. This is the post where I take a little toy car to the most prestigious automotive event in the world. The Pebble Beach Concours d'Elegance is hallowed ground meant for man and machine of a certain caliber of excellence. A playground for the super-wealthy. Why wouldn't I take it here?! We first checked out the Ferrari display at the gate, which featured legends both old and new. He liked the black 250 the best, so we stopped for a picture. There was also a FF and F12, a 458 Speciale, and the new F14T Formula 1 car. Then it was off to the concept car exhibit. The Torchbug was very excited for Mercedes-Benz's future with the Gran Turismo Vision concept. He thought it needed a felt racing stripe to match his, though. His good friend the Porsche 918 was there, complete with charging station. Then we stopped to see a replica of Karl Benz's wonderful invention. I really wouldn't be taking pictures of a model Volkswagen in Pebble Beach like this if it weren't for him. The Torchbug wanted to wish Maserati a happy centennial, so he stopped to check out this Zagato-bodied beauty. We made sure to get a picture with the legendary Rolls Royce Silver Ghost. Then we checked out this awesome gullwinged 1967 Ferrari Dino 206 owned by our favorite build-myself-a-one-off-guy, Mr. Glickenhaus! That's him on the left! A gentleman actually came up to me somewhere around here and asked if I had the Torchbug with me. He said he loved following the Bug's travels. Sir, I'm sorry I did not catch your name, but I hope you are enjoying the pictures! The coolest classic you didn't know existed: the Ruxton. There were several Ruxtons in attendance. They were so classic, elegant, and really stood out from the crowd with their shaped headlights and multi-colored striped paint schemes. A Bug and a Bug! That's me. Standing next to Sir Jackie Stewart. Holding the Torchbug. Yeah, that happened. 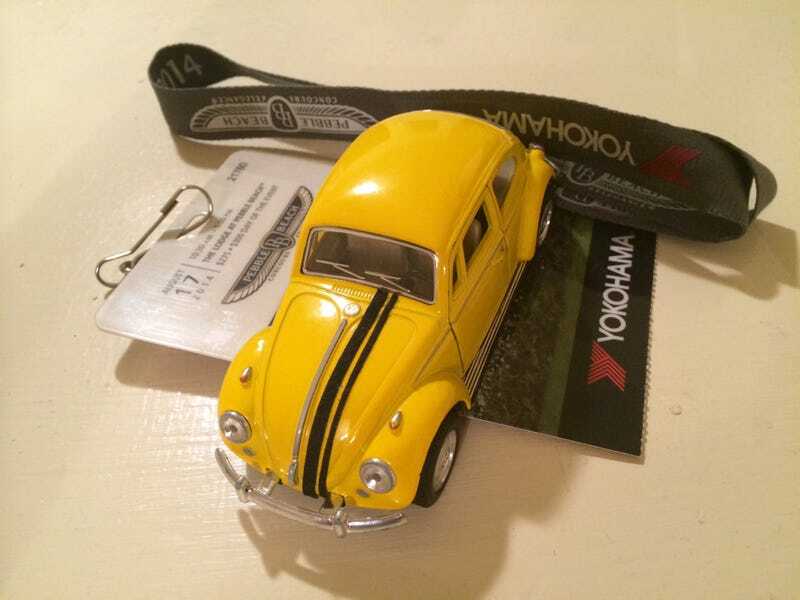 It's been a blast hanging around Monterey and Pebble beach with this little guy, be sure to check back with Live and Let Diecast once the Torchbug gets back to the East Coast. Want Authorship on Live and Let DieCast? Of course you do! Let us know in the comments and you&apos;ll be added!! This baby is growing and I want ALL of you to get time with it whooooo!